Many lead characters in video game RPG’s are white men, a handful are white women, even less are non-white and the rest of give you the option to choose your characters ethnicity. In the early years of MMO’s the creation of your avatar was limited, many were based on pre-created character templates. If found these early templates, were catered to more towards white avatars than non-white. There’s a lot of reasoning for this such as the game demographics, the country of origin, and the game type. Many of the early MMO’s were fantasy games that existed within a certain time area (such as the Dark Ages) or included many non-human races (elves, goblins, orcs) where ethnicity was not a factor. As MMO’s evolved, the limitations of avatar creation began to diminish and in some cases completely disappear. This does not mean that limitations do noe exist. In completely limitless worlds, such as Second Life, there’s more accessories to personalize female avatars than men. Ethnically, I believe Second Life suffers from a lack of content for non-white avatars, an issue that falls on the shoulders of content creators rather than Linden Lab. I find a preference to more white avatars in many MMO’s, either through interactions with NPC’s or the choices players make. There’s also MMO’s where the ethnicity of the character are quite limited. The lack of ethnic accessibility for an avatar can be on purpose, and sometimes liberating. Racial biases do not exist when an MMO is designed around very specific purposes. An example would be Disney’s Toontown, where your avatar is a cartoon character rather than a human. The issue of identity and possibly judgment based on the color of your avatars skin is a non-issue; however there may be other judgments such as the animal your Toon represents. Another example would be Guild Wars: Factions, which is placed in an Asian environment. While the avatar customization is very broad, it is going to reflect an Asian avatar. This re-enforces the fact that this virtual world is a game, with a set storyline, and world. The ethnicity of the user and the avatar are completely separate and can’t be used to judge other players or avatars. I’ve asked several of my white friends (I hate that term) why they have black avatars. The question I’m really asking is if their choice was of their own accord or a result of some other factor or bias. I’ve found, in more open ended virtual world spaces like Second Life, their choice is based squarely on preference. They found elegance, beauty, and were drawn in by more exotic features that are not present in white avatars. When I asked the same question to my non-white friends who played white avatars, I found the answers to be a mixed bag of preference and perception. While some preferred non-ethnic avatars or avatars outside of their ethnicity for many of the reason’s my white friends did, others had a perception that there was no choice. In the MMORPG setting, many of my ethnic friends choose white avatars because many RPG’s never had a lead black character. They seemed to have this perception that black people don’t exist in RPG’s, so when playing an RPG or anything similar to it, they choose a white avatar. Another perception for their choice is based on the biases skin color has; something that stems from their life experience. There are extremes to preferences and perception. Commonly there are individuals who choose ethnic avatars and role play in appropriate settings, an example would be a person choosing an Asian avatar to role play in an Asian based setting. While a preference, it’s a preference made on an extreme and can be justified. 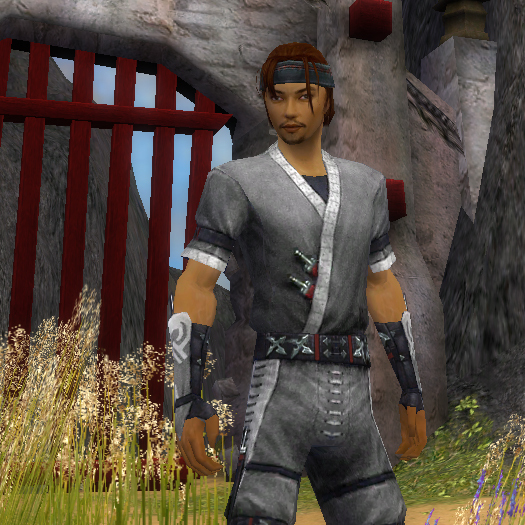 In the case of Guild Wars: Factions a non-Asian avatar would seem out of place. The extreme of perception is a person chooses an ethnic avatar purely to act based on stereotypes. One example of this would be a person choosing a black avatar mainly to role play as a hip-hop gangster. The grey area here is what’s offensive and what is not, is there, or should there be a line drawn. It’s really hard to determine, but many find in non-role play settings, a acting on stereotypes can be very insulting. Even within role play settings offenses can be made. On top of this issue of preference and perception the choice of an avatar is often clouded by real life experiences. In many cases it builds upon the preference or perception of the avatar choice. I’ve played a white avatar for some time before choosing a non-white one. This was usually in a role play setting, where I was playing a character rather then representing myself. When I choose a non-white avatar, I was questioned about this choice, an occurrence that never happened with my white avatar. The simple answer was, “It’s who I am.” The complex answer stemmed from the fact that I choose white avatars because of my experience of racial stigmas as a Hispanic/Black male. In today’s world, racism is not an issue of the past; racial profiling and biases based on skin color happen all to often. You can’t change the color of your skin in real life, but in virtual worlds you can be anything you want to be without anyone knowing. A thought that played though my mind was “do you really want to go through all of that again?” Meaning, do I want to potentially deal with all of real life issues surrounding my ethnicity in virtual worlds. Can I deal with possibly being judged based solely on the color of my virtual skin. The perception was that I had an opportunity to not be judged by my ethnicity but the contents of my character. It was a clean slate. However it was also my life experiences that made me choose an ethnic avatar. I began to feel I was not properly representing myself and my identity, even while killing level 60 raid bosses. I found myself becoming more conscious about the ethnic decisions I was making about my avatars. I’m not saying I always chose a non-white one, but the thought crossed my mind. To put this into prospective the choice became the same reason why my avatars are predominantly male. It’s because I am a male, and wish to represent myself that way. Sometimes I’ll choose a female avatar, but most of the time I would want one that is representative of my gender. I find that most ethnic persons who are invested in virtual worlds have the same internal discussion based on their life’s experience. Ethnic bias is an issue that’s not going to disappear anytime soon. At some point in life I’ve felt there was a target planted on my back with the world aiming at me because of my skin color. I know many others have felt the same way, even if it is just for a moment. Virtual worlds provides the opportunity for anyone to leave that behind often demonstrated is by being someone completely different and walking in their shoes for a moment. Ethnicity in virtual worlds is not black or white issue (forgive the pun) as everyone has a different goal. Developers have a product that’s created around a series of parameters, such as genre, themes, setting and the end result for it’s users. Users have their own goals as well, is the virtual world they are in purely for entertainment, making new friends, socializing, business, or exploratory. “The Goal” represents what the user wants to do, and what the developer will allow them to do. On the developer side, the goal of World of Warcraft is to beat things with sticks to get bigger sticks to beat bigger things; in Second Life the goal is to provide a platform that encourages user creativity. For the user, it goal can be quite different, in WoW stick beating is the predominant goal, however so is socializing. Within Second Life, the goal is up to the imagination of the user. “The Goal” also factors into avatar ethnicity. In Warcraft you have the choice to be several different races (Elf, Goblin, Gnome, Human); ethnic choice is not the first concern. Each race has its own abilities that helps or hinders certain game play and has priority over the the color of an avatars skin. In Second Life, ethnic identity is a pretty high priority, next to gender. If your using Second Life as a business application and want to represent your real self, your gender, clothing, body shape and ethnicity would probably be similar. On the other hand, if Second Life is more of a game or fantasy world, you may not even choose to be human, maybe a cube or some sort of dragon, or even a machine. “The Goal” of each individual is based on their perception of the virtual world. There’s a lot more that can be said about ethnicity and virtual worlds. Many of it stems from current social and cultural aspects. When I started writing this post, I wanted to harp about the lack of ethnic choices many MMO’s seem to have, however before doing that I realized I had to take a look at the larger picture. Why does it seem there are the lack of these ethnic choices? Do they exist? Most importantly why? Ethnicity is an important aspect to many people’s identity, I wonder how this issue is viewed not just by users but also developers. This entry was posted in Metaverse and tagged Discussion, Ethnicity, Exploration, Guild Wars: Factions, Second Life, Virtual Worlds by Nexeus Fatale. Bookmark the permalink. Nexeus I think you worry too much and aren’t giving people an opportunity to be free of ethnic bias – you seem to see it everywhere, but I think you need to take a deep breath and “let it all go” when you log on. Let all your RL tensions and insecurities go, leave them at the log on screen and just be yourself – the yourself that exists inside. I don’t agree with all your sweeping statements that racial identity is important in SL – it’s only important if you let it be. I can see it’s important to you, but I’ve never met anyone in SL who said or acted like it was important to them. But since it is important to you, why don’t you try spending some time in a skin that cannot have any ethnic bias attached to it? Blue skin (for example) looks very striking on men and yet you won’t be judged on your RL ethnicity, age or body shape just because you’re blue and you will be free to be yourself. I spend a lot of time in SL in a blue skin (and other colours too) and no one cares about my RL ethnicity. It’s a total non-issue that has never been raised once. They just take me as I am (because they have to) and it’s very liberating mentally. Come on – give it a try. Faerie (who will be spending this week in SL as a blue mermaid). The points Nexeus makes are significant. Ethnicity is always an issue for people of color, either in rejecting it or embracing it. This is true in SL as it is in RL. Many times whites cannot appreciate the significance of the issue because they do not generally associate whiteness with group identity. For people of color, even if they reject group identity, it will be “assigned” to them by others who see them as belonging to a group. Finally for whites it is much less a problem because their images are EVERYWHERE. This is not true for people of color, particularly for avatars of color who must hunt hard to find images that reflect them. It doesn’t mean we don’t enjoy the game. It just means we have to adapt the game so that our reality is recognized within it, just as the realities of others are. Thanks for the post Nexeus.